Wally is a real fan of Mom’s Gourmet. This is a fantastic recipe for salmon that can be done in a flash. 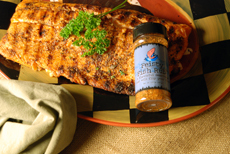 While we do have lemon pepper in Feisty Fish, Wally suggests add more for a little extra pepper/citrus flavor. Wash fish with cold water and pat dry. Rub the fish with olive oil. Place on a plate and give a good sprinkling of both spices, about equal of both on the meat portion of the fish. Coat with sliced onion rings, and place on the grill. Shut the lid and cook until done (time depends on size and thickness of filet). Fish will be a lighter pink and flaky than when you started. Great taste! Easy.